WASHINGTON, Mar 8 2012 (IPS) - This week was supposed to be all about Iran – at least, that’s how Israel and its powerful U.S. lobby, the American Israel Public Affairs Committee (AIPAC), had planned it – and why the U.S. should prepare to bomb it very, very soon if its leadership doesn’t cave into Western demands to abandon its nuclear programme. By week’s end, however, the most urgent foreign policy issue with which U.S. policy-makers – and their media camp followers – were grappling was whether to bomb Syria first instead. Remarkably, the sudden deviation was triggered by Tuesday’s dramatic call on the floor of the Senate by Republican Sen. John McCain for the U.S. to provide decisive support to rebels battling to oust the regime of President Bashar al-Assad. “The only realistic way to do so is with foreign air power,” declared McCain, whose strategy was swiftly endorsed by his two hawkish fellow-travellers, Republican Sen. Lindsay Graham and independent Sen. Joseph Lieberman. “The United States should lead an international effort to protect key population centres in Syria, especially in the north, through airstrikes on Assad’s forces,” he declared, touching off a vigorous new debate that radiated from the Capitol to the Pentagon and the White House about how deeply and how violently to become involved in yet another predominantly Muslim Middle Eastern country. While Defence Secretary Leon Panetta rejected McCain’s proposal, the administration appears to be moving closer to providing some forms of “non-lethal” equipment to the opposition by week’s end. What was most remarkable about the move by the “Three Amigos”, as they are sometimes called in part, was its timing. It came just as some 13,000 activists, energised by three days of juicy anti-Iran red meat dished out by everyone from Israeli Prime Minister Benjamin Netanyahu to the top three Republican presidential candidates, as well as the Republican and Democratic leadership of both houses of Congress, were being bussed from AIPAC’s annual extravaganza at the Washington Convention Centre to Capitol Hill. The mission was to persuade their elected representatives that the spinning by the mullahs of even one centrifuge to enrich uranium on Iranian soil posed an “existential” threat to Israel, if not quite yet to the U.S. itself, and was hence “unacceptable”. No talking points on Syria at all were included. In fact, out of the literally scores of breakout briefing sessions that ran continuously between plenary sessions during the AIPAC conference, only one dealt directly with Syria. That’s why the abrupt change of subject by the Three Amigos, all staunch advocates of Israel and great admirers of Netanyahu (with whom McCain and Graham had just met the week before in Jerusalem after which they publicly they publicly deplored President Barack Obama’s failure to align U.S. policy toward Tehran with their host’s), was so perplexing. Of course, there is a connection, and neo-conservatives (whose views are most reliably represented in the Senate by the Three Amigos) have worked increasingly assiduously at establishing it in the public mind as Syria has slowly slid toward civil war over the past year. The Assad regime, they never cease to point out, has been Tehran’s closest and sometimes only ally in the Arab world, and its ouster would constitute a serious setback not only to its regional reach and influence, but also to another of Israel’s most dangerous foes, Lebanon’s Hezbollah. In that respect, he and the neo-conservatives have argued, U.S. military intervention in Syria would be “very different” from last year’s intervention in Libya, which the Three Amigos also strongly supported. 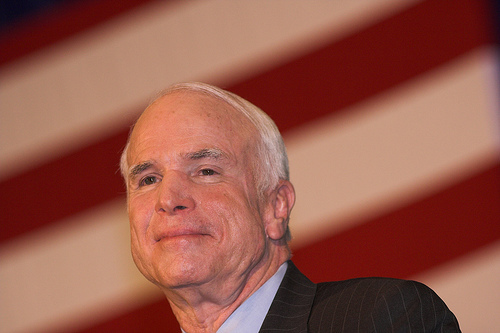 In addition to the moral and humanitarian concerns on which Washington, NATO, and allied powers justified their intervention against Gaddafi, military action against Assad would also serve U.S. “strategic and geopolitical interests”, McCain asserted. McCain’s argument partly echoed a much-noted New York Times op-ed by a former director of Israel’s Mossad, Efrain Halevy, who, significantly, has been one of the main figures in that country’s national security establishment who has publicly questioned the wisdom of an Israeli attack on Iran’s nuclear facilities. Unlike McCain, however, Halevy did not recommend direct military intervention in Syria, suggesting instead that Assad would go the minute that Russia, Assad’s main arms supplier and diplomatic protector, was persuaded to drop its support, a strategy that the Obama administration appears to be pursuing. Although individual members have occasionally spoken hopefully about Assad’s demise, Netanyahu’s government has mostly kept a discreet silence on Syria. This reflects, among other things, concerns that chaos and civil war in such a heavily armed state, the possible ascendance by the Muslim Brotherhood or more radical Islamist forces, or both could prove more threatening than continued rule by the Assad dynasty, which, despite its support for Hezbollah, has kept its common border with Israel quiet for almost 40 years. It has been far more comfortable focusing international attention on Iran’s nuclear programme and the necessity for the U.S. to take military action to stop it or to at least give Israel the wherewithal to do the deed. That was supposed to be the message coming out of the AIPAC conference and amplified by friendly Republican presidential candidates this week. But for U.S. neo-conservatives, who generally feel they know better than Israel’s government what is in its interests, the Assads have long been seen as Public Enemy Number One, and their present weakness represents the best opportunity in decades. Indeed, the ultimate goal in the strategy laid out in the infamous 1996 “Clean Break” paper prepared by prominent neo-conservatives for Netanyahu on the eve of his first term as prime minister was Syria’s destabilisation. The overthrow of Iraqi President Saddam Hussein – for which the paper was best known – was simply one step toward that aim. During the 2006 war with Hezbollah, neo-conservatives encouraged Israel to expand its military campaign into Syria, and, more than any other identifiable political faction, they have called consistently for Washington to provide material and military assistance – as former Deputy Defence Secretary Paul Wolfowitz did in a long column in the Wall Street Journal did this week – to the opposition for many months.